In case you were wondering, which you probably weren't, August 31 is National Bacon Day. In observance of this pork-filled event, Ford has customized a 2014 Fiesta by wrapping it with 10 strips of bacon. Well, more specifically, they wrapped it with a picture of 10 strips of bacon. Want to wrap your Fiesta in pictures of the heavenly hog? Have no fear, Ford is offering bacon graphics. No, really. There are "bacon racing strips" ($191.25 + install), which is two pieces of bacon that go on the car's hood and resemble classic racing stripes. There is also the "side of bacon" ($318.75 + install), which features two individual strips of bacon that wrap over the rear wheel. Finally, there's the bacon mini strips ($78.75 + install) that kind of go wherever. 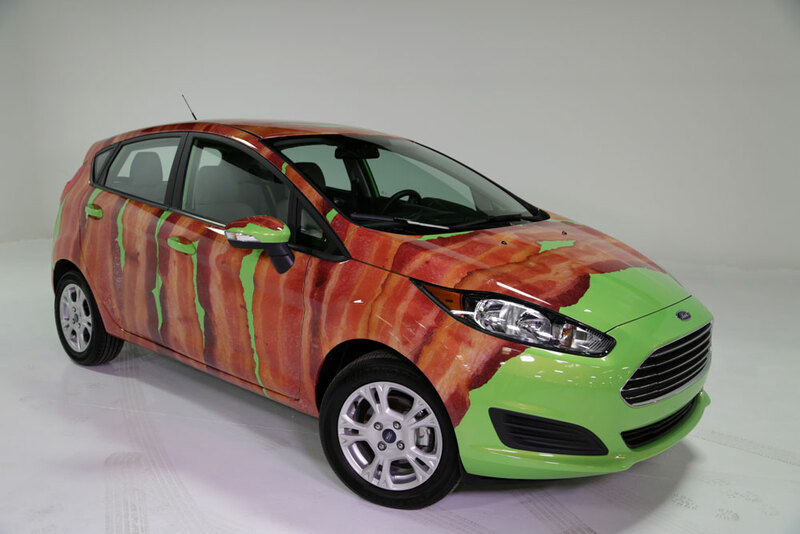 So if you've got a Fiesta, and love bacon, Ford has the accessory for you. Frankly, I want to see a Fiesta wrapped in real bacon. Real edible bacon. Now we're talkin'.